LONDON (AP) -- For a play that makes audience members contemplate their own mediocrity, “Amadeus” is quite the crowd-pleaser. 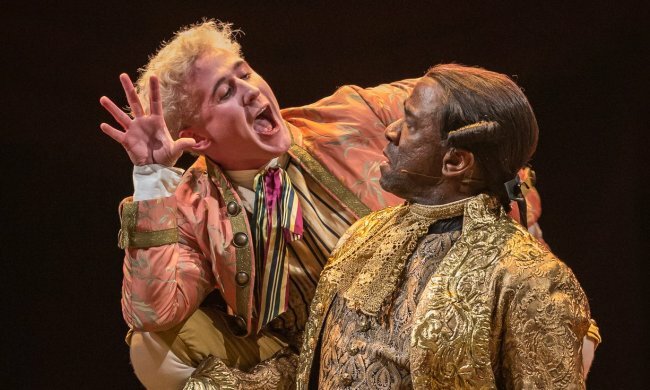 Britain’s National Theatre has a sold-out hit with a revival of Peter Shaffer’s play about bad-boy genius Wolfgang Amadeus Mozart and his jealous rival Antonio Salieri, composer to the 18th-century Viennese court. The production, which mixes actors, opera singers and a 20-piece onstage orchestra, is being broadcast in movie theaters around the world Thursday as part of the NT Live series. There are repeat screenings over the coming weeks. First staged in 1979, the play asks s an age-old question: Is it possible to separate an artist from their art? Shaffer’s Mozart is an overindulged prodigy whose divine musical gift coexists with bratty petulance and a fondness for fart jokes. Gillen, his hair bleached a punkish blond, plays Mozart with manic energy and an underlying fragility. But the real star of the show is the diligent, dignified and increasingly bitter Salieri. He is “the patron saint of mediocrities,” whose tragedy is that he recognizes Mozart’s genius and knows he will never match it. Zimbabwe-raised actor Lucian Msamati tackles a role that has been played by Paul Scofield, F. Murray Abraham and Ian McKellen. Salieri has “done everything right. He followed the rules, he worked hard, he was chaste, he was devout, he was good” -- and then he was confronted with a talent far beyond his own. In the play -- based very loosely on real events -- Salieri’s jealousy triggers a spiritual crisis with deadly consequences. Msamati says many of us can relate to Salieri’s sense of anger and betrayal. The hit revival of “Amadeus” is a fitting tribute to Shaffer, who died in June aged 90. But the production had a lot to live up to. The original 1979 staging, starring Scofield as Salieri and Simon Callow as Mozart, was one of the National Theatre’s biggest hits and ran for three years on Broadway. Milos Forman’s 1984 movie adaptation won eight Academy Awards, including best picture. Director Michael Longhurst’s revival has proved just as popular. It runs until March 18, and the National Theatre has announced it will return for another run in 2018. Longhurst puts Mozart’s music front and center, taking an unabashedly operatic approach that mixes actors, singers and onstage musicians from the Southbank Sinfonia. “Mike made no distinction between actors, singers and musicians,” he said. “From day one, we were a company. We’re telling this story together and everyone is bringing their particular abilities, talents, perspectives into making this the best that it can be. “Everybody had to step out of our comfort zone to make it work,” he added.